The Leng’s Grafted Samoan Stag is an exotic stag with a few unique attributes as well as possessing a long captive lineage history. Some of the unique attributes of the coral can be seen in the above image. It is a multi color stag that has color shades ranging from purple to turquoise. 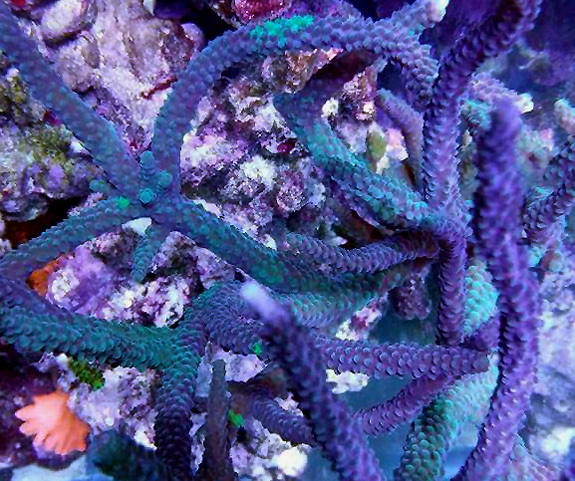 Polyps are typically a dark purple colored. The stag has also acquired some green grafting spots as can be seen in the image below. There also appears to be two kinds of grafting that can occur. One has a bright lime green color, while the other is more of a medium turquoise green. Back in the late 1990’s there was a brief period when stony corals were exported from the Samoan Islands. We believe this stag may be one of those as it traces its captive history origin back to around the 1997 to 2000 time frame. The current lineage of this stag is traced back to a section harvested from the Leng Sy main display tank at the end of 2001. 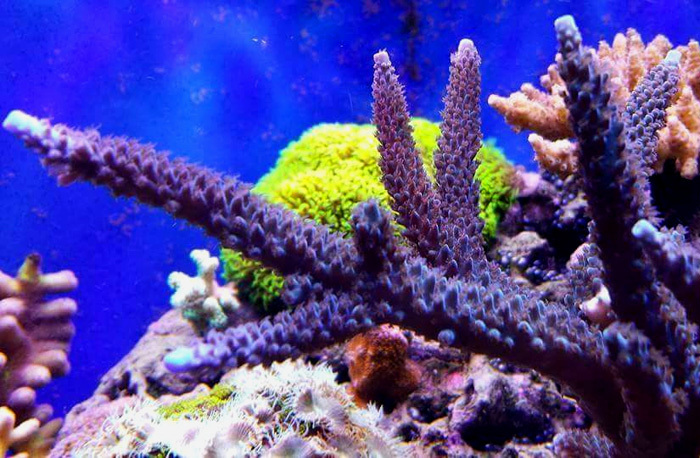 This tank had also housed the original Leng Sy Montipora coral. Leng harvested the fragment and gave it to his understudy Cruz Arias who is the same reef aquarist that kept the original Leng Sy Montipora line alive. The second image below of this coral is actually a good representation for how the Samoan stags looked back then. There were really only two types of stags imported from Samoa. A thin branched stag (which we believe is this one) and a thicker branched stag. Reeffarmers can not definitively say this was or is a Samoan, but it does look very similar in this image. 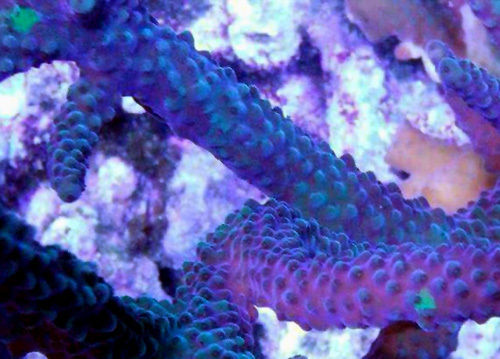 The last colony image below shows the more turquoise green coloration the staghorn can also develop. Reeffarmers received our seed fragment direct from Elegant Corals LLC and Cruz Arias. Reeffarmers is maintaining a seed section of this coral in a 8 foot Raceway Gyre BiZonal system. This system is naturally filtered with a semi-cryptic zone and a reef flat exposed zone. In this captive reef the coral is positioned to receive moderate light and weak to moderate water current. 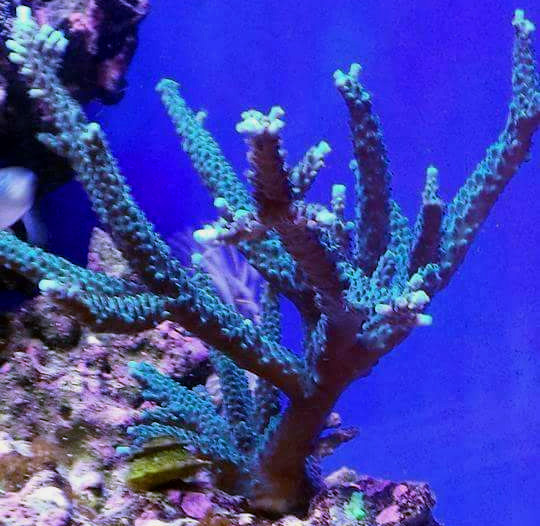 The first edition fragment of this coral is being sold on our Buy It Now web page. Recommended list price on May 11th 2015 is $110 for a small fragment.